Why I started running – Following a bereavement I was concerned about a recurrence of depression, which had a detrimental effect on my teenage years and twenties. I found walking helpful but having a full time job and commuting didn’t leave time to walk enough to help. I decided to try running. The first time, out of breath, I managed less than a minute. I persevered – moving on to run walking. Running was so difficult that I couldn’t think about any of the things that were making me sad, instead focussing on the run. I realised that I got home feeling more positive. Over the first months, I built up to running a few miles regularly. Running solo benefits – I relished the time to process my thoughts, to mull over current challenges and think of solutions away from daily pressures. I started running sure that my depression would come back but found that it helped to prevent this. I ate and slept better and was generally more relaxed and happier. Running soon became an essential part of my life. Joining Bournville Harriers – On moving to Birmingham, I was hopeful I would find a running club to make friends and develop my training. 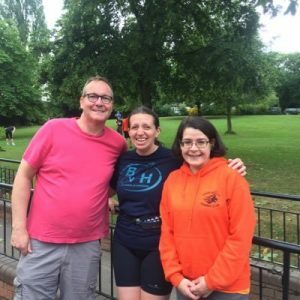 I met a runner with Bournville Harriers and started joining them for some runs. I found them incredibly friendly and welcoming and, importantly for my current goals, my running improved through the regular coached sessions and consistently running; Harborne Hilly 6 (miles) to give one example! Mental Health Champion for Bournville Harriers – England Athletics started a new initiative known as Mental Health Champions, closely linked to a #runandtalk campaign. In their newsletter, they asked for volunteers with a lived experience of mental health challenges to volunteer. I and one other club member signed up and we were asked to incorporate this for our club as well as offering something to those outside the club. Fortunately our club have been really positive and supportive about the initiative, we have regularly held ‘run and talk’ runs on club nights and encouraged positive dialogue around mental wellbeing. We also set up fortnightly Run and Talk Cannon Hill events open to everyone. We were supported by an enthusiastic team from our club and the Mental Health Champions from Kings Heath Running Club. Coinciding with Time to Talk Day our next events will be time to talk at our club night on 7th February and our next run and talk Cannon Hill Park on Saturday 9th February. Run and Talk Cannon Hill – Find us at the bandstand in Cannon Hill Park at 10am on the second and last Saturday of every month. We offer a friendly walk, jog or run and a chat for all levels including complete beginners.